It can definitely be said that the JPG format offers some truly fantastic features to all its users, such as choosing between the size of the file and the overall quality of the image, thanks to its lossy compression system. It also cleverly exploits the human’s eye natural differentiation in processing between the amount of light, and the color difference that a certain image has. The eye can distinguish the most delicate changes in lighting conditions, in comparison to our perception of differences in color. Because of this we almost see black-and-white in dimmed light, and the JPG quite cleverly utilizes this difference, compressing the color data of the image to a much greater extent than the lighting part. But in spite of the many versatile capabilities of JPG format, graphic design professionals of all kinds are fully aware of the advantages of converting digital JPG images and other digital drawings to PDF format. So, why are JPGs most oftenly converted to PDF? Every individual PDF document is smaller than its JPG version, because it compresses the data inside of each file much more densely. The second reason is print, for printing JPGs is very troubling because of the difference of so-called Pixel dimension, which differs when the file is viewed on a screen and when it’s sent to printing. Using a PDF for printing of images is perfect, because the printed end-result is always identical to the preview on the monitor. Adding images to a textual document, and establishing absolute conditions for viewing that file on all operating systems and devices (PDFs are viewable everywhere because of their unique universal formatting). How do I convert JPG to PDF? 1Download PDF Converter Elite and the virtual printer will be installed automatically. 2Open the image in any default image viewer and click on the File menu. 3Click on the Print button and from the list of printers choose PDF Converter Elite printer. Note: When the file is converted to PDF, you can open it with any PDF reader but you can also open it in PDF Converter Elite viewer. 1Start the program and click on Create button. 2Click on cancel button and you will be asked to save the PDF file before closing. 3In the file name field, type the name of the file and click Save. Make sure you check the location where the file will be saved. How do I convert paint to PDF? Microsoft Paint file is downloaded to every Windows computer by default. It is pretty simple to use, and even users with lack of design skills can make images in it. Paint is particularly useful for cropping images, changing colors and making screenshots. If you want to convert paint to PDF, that would be the same as JPG to PDF conversion, because Paint files can be saved in JPEG format. Paint program offers its users to save files in multiple image formats: jpg, png, gif, bmp and others. So if you save a paint file as jpg, you will be able to convert your paint file to PDF by following the same instructions explained above. 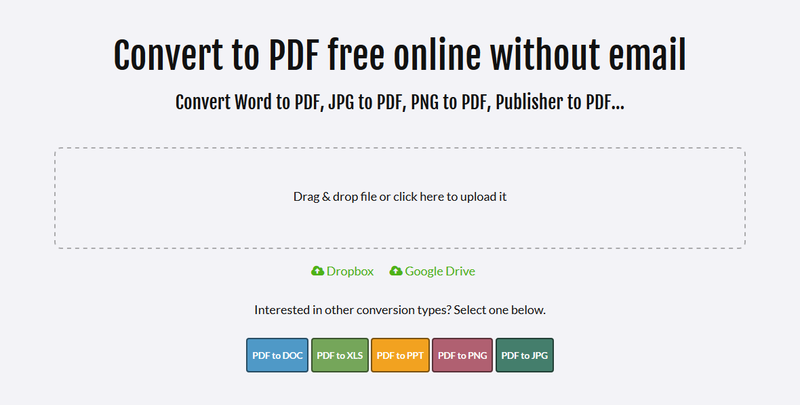 Use our free online PDF Creator to quickly convert JPG to PDF wherever you are. Access the tool from a mobile browser, laptop or any computer. Drag and drop files from the local storage or import them from the cloud. There are no limits, you can convert as many files as you like for free, without hidden costs. No email required. The file is automatically converted and ready for download, a few moments after the upload.